If you're walking around the Wynwood Walls in Miami, don't be surprised to see a bit of the Hamptons. An entire wall, aligning a sidewalk with a perfect view from an outdoor cafe, has been wrapped by art by Bert Stern, courtesy of Keyes Art. Wynwood Walls is famous for its street art and urban murals year-round. When Art Basel Miami Beach and the art fairs come to town, it truly sizzles with new work. The Bert Stern installation can be found at 2407 NW. 2nd Ave, Miami. It will be on view through Sunday, December 16, 2018. And yes, images of Marilyn Monroe are there from his now iconic "Last Sitting" photo shoot with the star in 1962, six weeks before her death. A detail of Bert Stern's installation that opened in Miami, 2018. Photo: Julie Keyes. Courtesy Keyes Art. As one of America's most influential and celebrated photographers, Bert Stern was known for his iconic portraits of Elizabeth Taylor, Richard Burton, Marilyn Monroe, Kate Moss, Brigitte Bardot, Marlon Brando and Ray Charles and many others. Last summer, Keyes Art presented a blow-out solo show of Bert Stern artworks in East Hampton, NY that focused on his advertising and fashion work. Known as one of the original “madmen,” Bert Stern helped reinvent advertising photography by using dynamic, startling images that didn't necessarily have a direct pairing with advertising text as was the norm, at the time. For example, his classic ad for Smirnoff vodka in 1955 was shot with the Great Pyramid at Giza looming in the background behind a martini glass---but it appears upside down inside the glass. During his 50-year-career, he created countless award-winning ads, editorial features, magazine covers, films, and portraits. His 1959 documentary about the Newport Jazz Festival, Jazz on a Summer's Day, was deemed "culturally significant" by the United States Library of Congress and selected for preservation in the National Film Registry Marilyn Monroe is there. For Wynwood Walls, Julie Keyes of Keyes Art has selected an array of images that are classic Bert Stern images. Continue scrolling to check out the Bert Stern public art installation. A view of Bert Stern's installation that opened in Miami, 2018. Photo: Julie Keyes. Courtesy Keyes Art. Bert Stern's installation that opened in Miami, 2018. Photo: Julie Keyes. Courtesy Keyes Art. 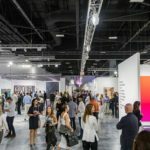 BASIC FACTS: Miami Art Week runs from December 4 to 9, 2018 in Miami and Miami Beach. The Bern Stern public installation can be found in the Wynwood Walls at 2407 NW. 2nd Ave, Miami Beach, FL. It is on view from December 2 to December 16, 2018. For information, contact Julie Keyes by emailing juliekeyes15@yahoo.com or calling 917-509-1379. For more information, visit www.juliekeyesart.com. Looking for art fairs? Check out our Ultimate Guide to the Miami Art Fairs 2018 to help you navigate the week.